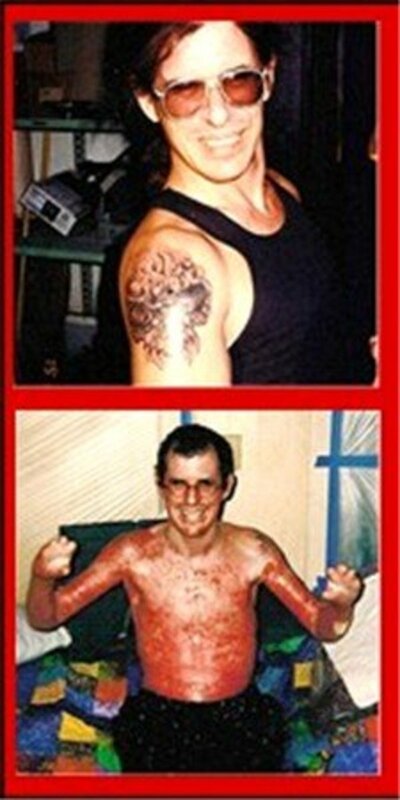 In 2002, my husband was severely burned over 85% of his body in a flash fire explosion. Once the burns healed, he got tattoed. 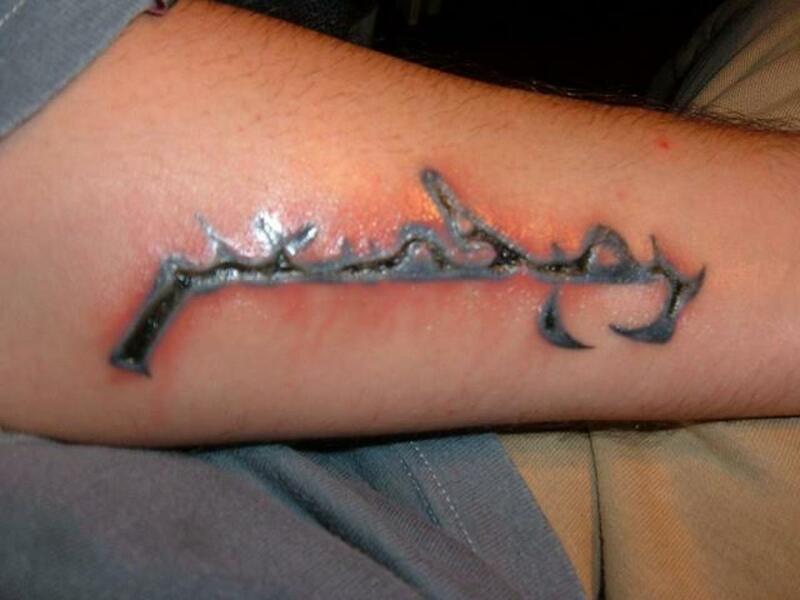 Can You Get a Tattoo on a Scar? Well, that is exactly what we wanted to know. So I got online, of course, and started searching Google. I tried all kinds of different words and sentences that included "tattoo," "burn," "scar"... you get the idea. Well, there wasn't much info out there, and what I did find was mostly forum Q&As. Which of course contained very different answers, no real info, no photos of a tattoo on a scar, and no real description of the process of tattooing on scars. So, if you have been considering getting a tattoo on a scar or grafted skin, then here are some real answers that will show you the process, with photos, to help you decide if you are ready to consider this for yourself. On August 6th, 2002, my husband Scott was severely burned over 85% of his body in a flash fire explosion. Before Scott's accident, he had a one-of-a-kind skull tattoo on one shoulder and a large wizard on the other. The skull was completely burned off, and all but the top of the wizard's staff burned off. 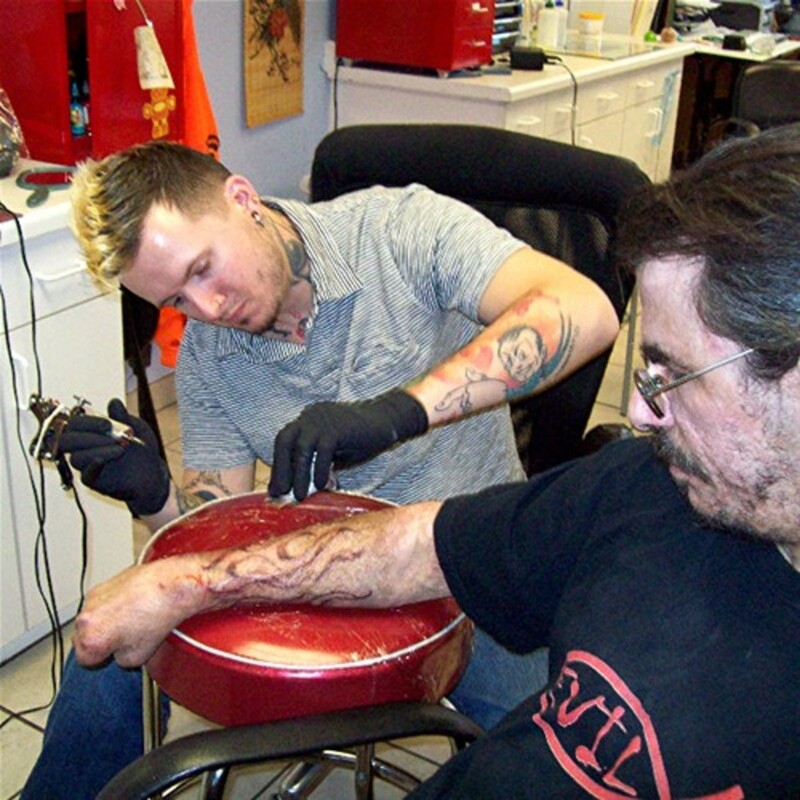 Scott has contemplated getting another tattoo since his accident, but he was unsure how the grafted skin would take a tattoo. We had heard of people getting tattoos on grafted skin, but Scott has 100% grafted skin on his arm where he wanted the tattoo. 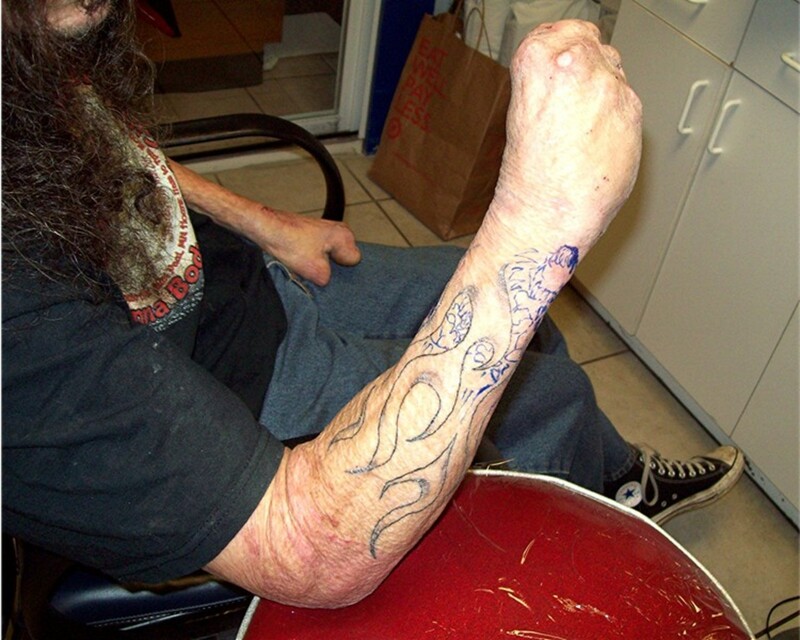 So finding a tattoo artist who had experience with grafted skin was important to us. We tried looking up information online about tattooing on burn scars or grafted skin and came up empty-handed. We talked to the tattoo artist who had originally done the skull on his arm, but he seemed skeptical about if it would look good or not. He seemed very reluctant to even try it. So our next stop was to see Dang. 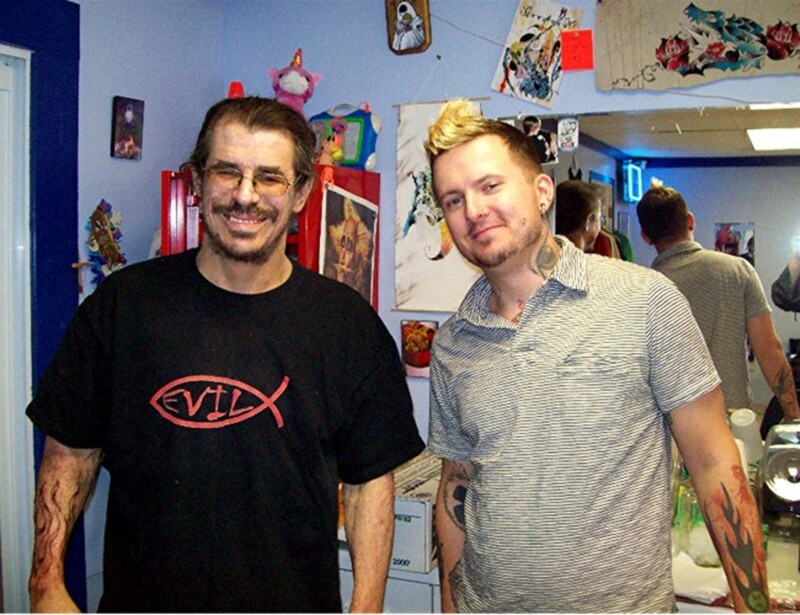 Dang is the hubby of an old friend of mine, and he is the artist who does my middle son's tattoos. I have quite a few tattoos myself, some of which are over 20 years old, so I have seen a lot of changes in the tattoo industry since I got my first one. Back in the day, people could just walk into a tattoo shop, drunk or high or whatever, and get any crazy-looking tattoo you asked for right there on the spot. A lot of the old tattoo shops were filthy, with grungy bikers hanging out, smoking, drinking and swearing, while some hungover biker gave you a tat with the same needle he had just used on the last customer. True, back then, that atmosphere was all part of the thrill of rebelling and getting a tattoo in the first place. Thankfully, times have changed. These days tattoo shop are usually very clean and well-run businesses. 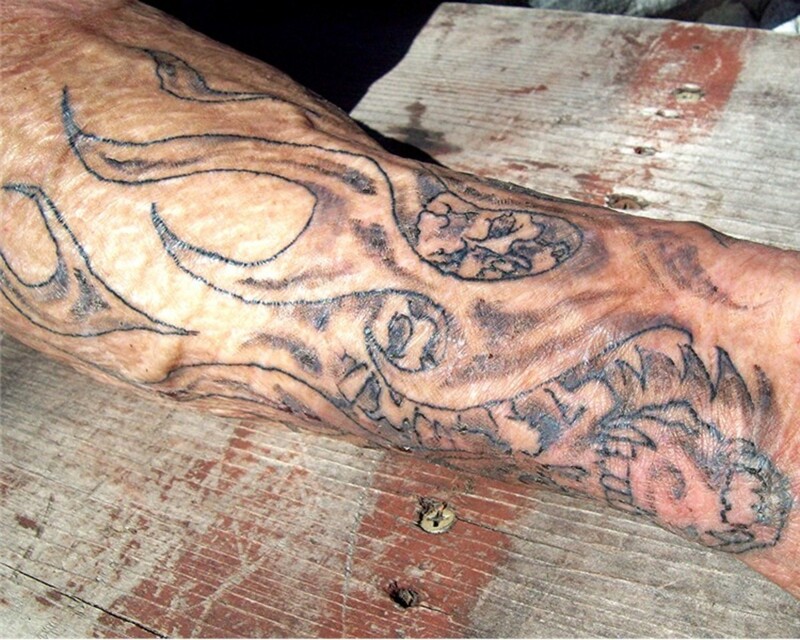 There are now Sanitation laws and tattoo shops need to follow rules and be licensed. This makes getting a tattoo a much safer experience than it used to be. Still, not every business is run the same. 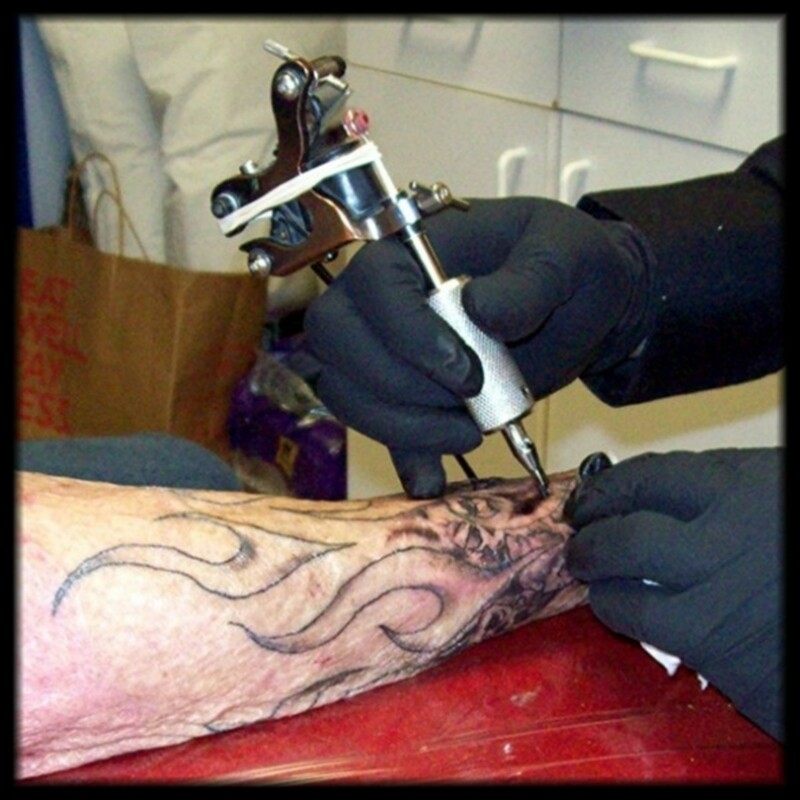 When you choose a tattoo shop, you want to choose one that is clean and where the license is prominently displayed and up to date. Never get a tattoo at a shop where they don't ask for your ID and have you fill out a form that asks you medical background questions. 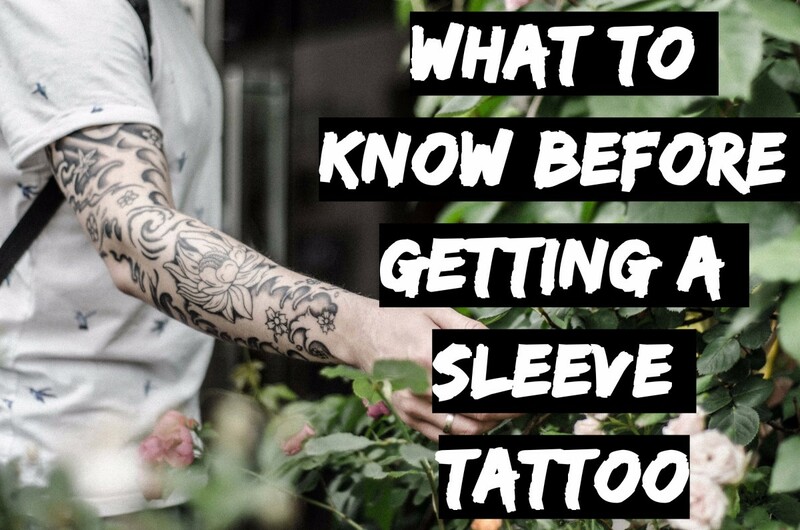 Make sure the shop you choose actually follows the safety and sanitation procedures, like sterilizing equipment, wearing gloves, cleansing the area of your body where the tattoo is going to be placed. 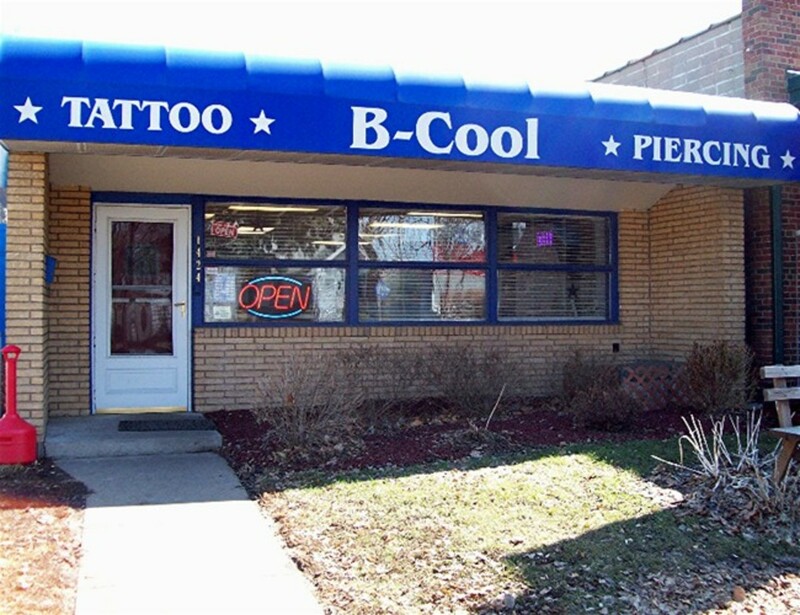 My personal review of B-Cool Tattoo, the shop we chose for Scott's tattoo, is five out of five stars. It is cleaner than most hospitals, the people who work there are friendly, knowledgeable and very helpful. They even have a machine with snacks! Well, DANG was my first choice all along, but Scott had really loved that skull tattoo and was hoping for the same artist so that he could design something similar. Talking to that guy though, was enough to convince Scott to talk to someone else. Scott liked DANG right away, I knew he would. DANG assured him that yes, he had done tattoos on scarred and grafted skin and though it was different, it was definitely do-able. Plus DANG has such an easy going and likeable personality. One of the reasons I wanted Scott to go to Dang, was because I was already aware of DANG's incredible artistic ability. 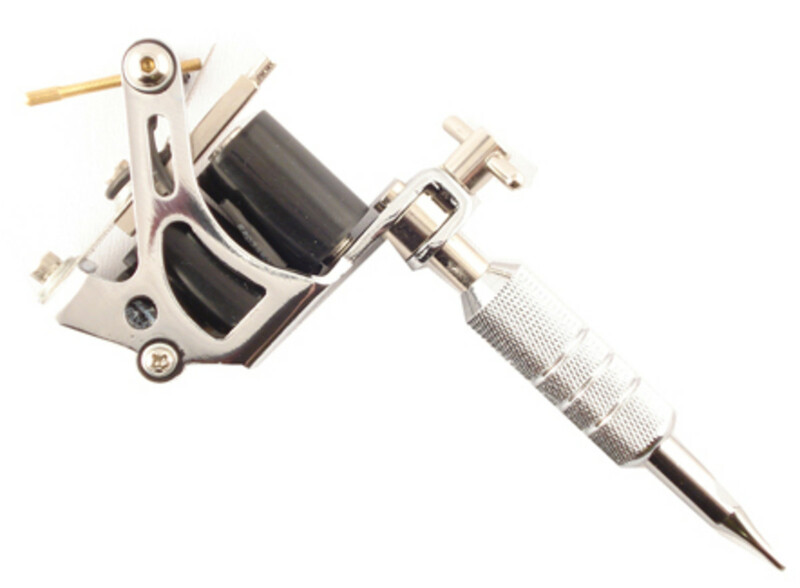 A lot of tattoo artist rely on transfers for their tattoo designs. A transfer is where they photocopy the image with special ink, or trace the image on carbon paper and then rub the carbon image onto the place where the tattoo is going to be. Then they just basically tattoo on the lines and fill in the color. I knew Scott wanted a one of a kind design, and I knew that DANG had the actual artistic skill to deliver. 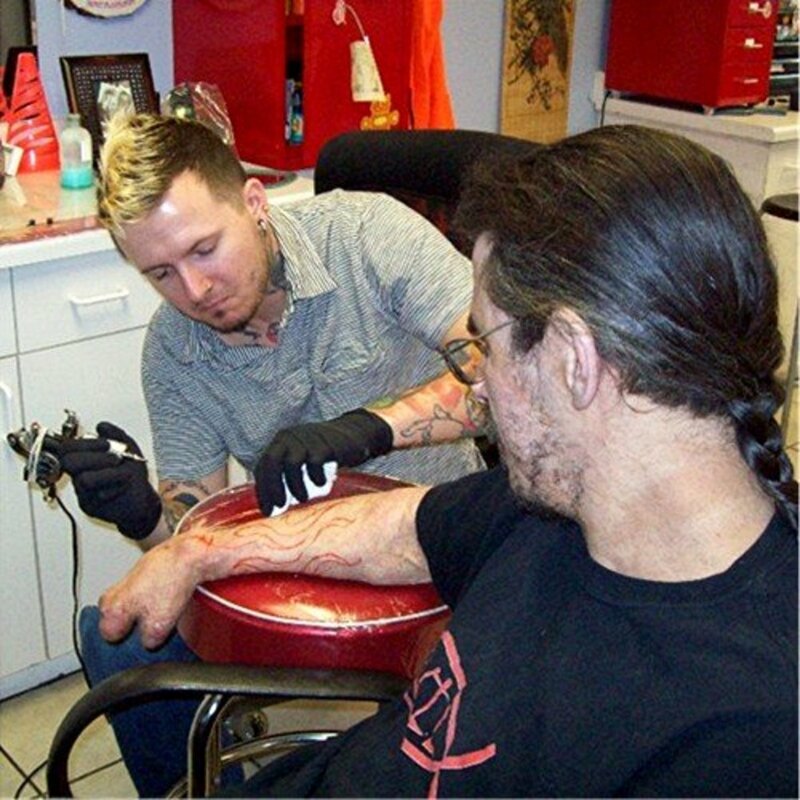 Because Scott is getting a tattoo on grafted skin, it will take more than one visit to complete the piece. This first visit, DANG is just doing the outline of the flames and some basic shading, to see how well Scott's skin takes the ink. On Scott's next visit, DANG will be incorporating skulls and more shading into the design. We will add Scott's next visit to this article, after it happens. Dang snaps a photo before starting Scott's tattoo. Q: Do you prefer DANG or Mr. DANG? A: Either one is okay. It's funny all the strange variations we get when people call. People ask for Dan G. a lot. Q: How long have you been doing tattoos? DANG draws out the design. Q: When did you decide to become a tattoo artist and why? A: I did the corporate thing and was good at it, but tattoos are just so much more personal. If someone's happy because I helped them through their very first [even stamp-sized] tattoo, they're really happy. It's just more "pure." Q: Which tattoo artist or artists are your favorite and why? A: I don't really do the idol thing, but there are a lot of innovative artists bridging off of the old-school style that I really like: Adam Barton, Stevie Edge, Matt Rinks, Seth Cefari, and so many that nobody's heard of... yet. Q: A lot of the younger generation of tattoo artists started out as taggers or graffiti artists. 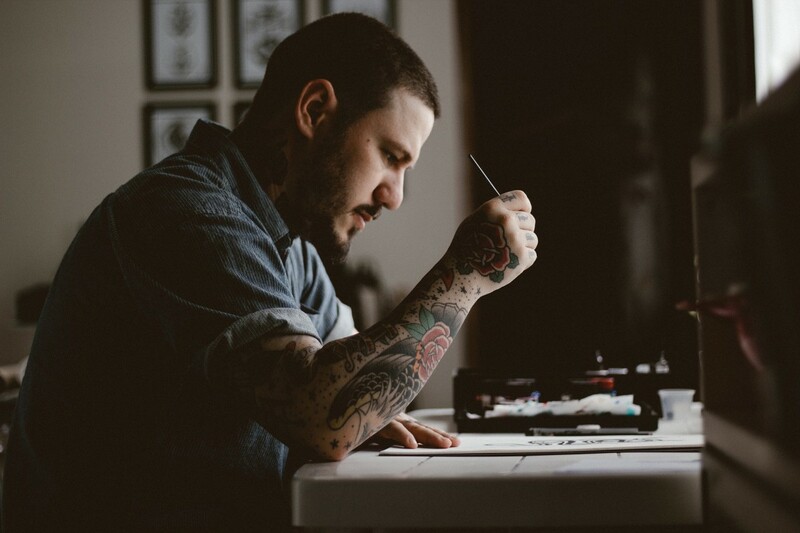 Were you into that scene before becoming a tattoo artist? A: Nope, grew up on a farm. There'd be a pretty short list of suspects if I were to tag a cow. Q: What is the best advice you would give someone thinking about getting their first tattoo? A: The more personal the better. Get it how you want it, where you want it. If you really want it, you can handle however it's going to feel. Q: Other than tattoo art, what is your favorite art medium? A: Pop art, sequential art. Q: Where can we get DANG gear like t-shirts, buttons, and stickers? A: At my online store. Grafted skin has much more texture than normal skin. Q: You have a published graphic novel. Tell us about it and how it came to be? A: My latest book is my 11th published book (and largest to date), GREYDUCK: Volume of Roars. I've been occasionally self-publishing on the side (in my extra-extra-extra spare time). GREYDUCK was an idea that all of our pop culture has an energy to it, all the importance we place on things (both superficial and nostalgic), a life to it. In the book, I flesh out a lot of my own pop-philosophy through the genre of Daikaiju (giant monsters). Drawn in my own offshoot of the old-school tattoo style; it's funny, wild, and so surreal that its most bizarre moments just might actually mean something. DANG an evil-genius at work! 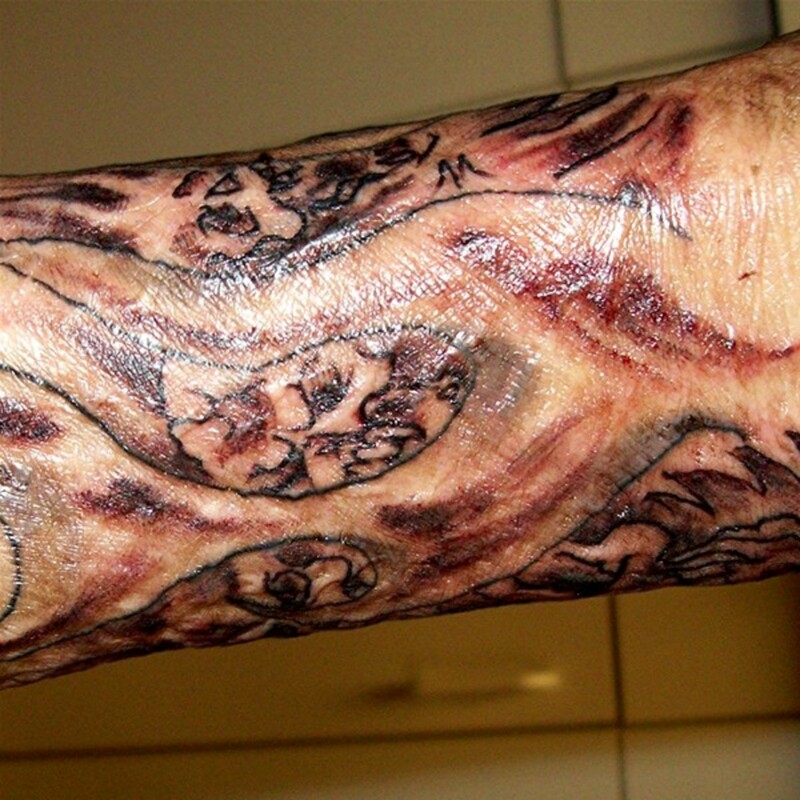 Q: How is tattooing on grafted skin and/or scar tissue different? A: When considering working over a scarred area, you want to wait at least a few years after the injury, wait for the scar to whiten/lighten up. Often the details aren't as crisp, texture of the scar can affect the consistency of color/shading, and the skin sheds differently. Q: What are some of the other types of scars that you have tattooed on? A: Cuts, burns, surgery scars, stretch marks. I even had a client with a small gecko tattoo on her stomach that was cut in half and shifted a bit from a car accident scar. We re-attached 'im. Q: What type of tats do you recommend for people with grafted skin and/or severely scarred skin? A: Same as anyone else, look for what you like. Just takes a little experimenting to see what the tissue will take. Q: What are your plans for the future...What will Mr. DANG be doing 5 or 10 years from now? A: Probably same as I'm doin' now, helpin' the world express itself... but in the future... maybe a silver jumpsuit? 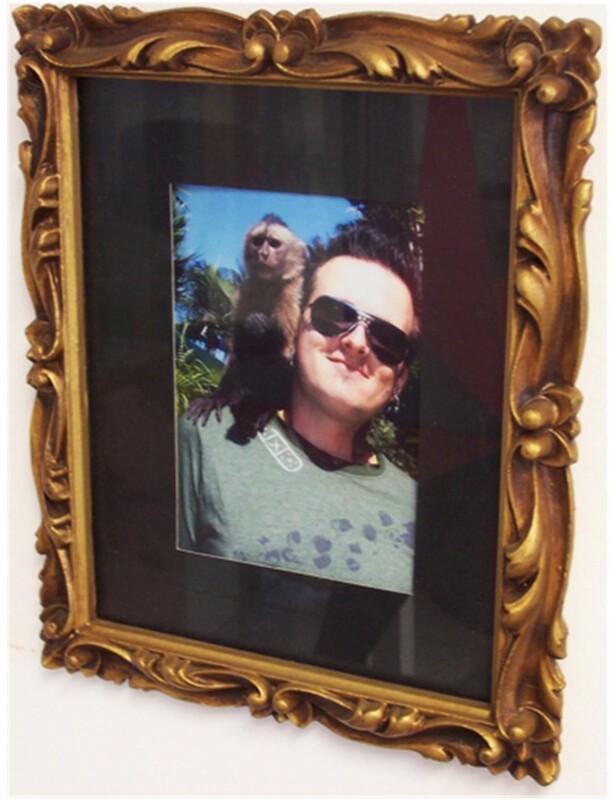 So where can we view and buy prints of your incredible artwork? Q: What else are you currently doing artistically that you want people to know about? A: GREYDUCK is still pretty fresh-squeezed, so I'm hitting a few conventions this year to promote it (G-FEST in Chicago, and MNCBA Fallcon at the MN fairgrounds). Also working on more Flash art and pop art. See A'LA DANG for updates! Q: Does it feel different to get a tattoo on grafted skin than it felt getting your other tattoos? A: Definitely, the other ones hurt. I don't have any nerve endings anymore on the grafted skin, so there was really only a little pain under the wrist. Everywhere else it was just like a slight vibrating pressure. Q: What do you think of the tattoo so far? A: Love it! I can't wait to come back and get the skulls put in. Scott's tattoo one day after the first visit. His grafted skin bruised from the shading, but not the outline. On our 2nd visit, DANG again starts by drawing where he intends to tattoo. Again we see that Scott's grafted skin easily bruised where the shading needle was used. DANG rocks! Scott is very happy with his new tattoo. One week later, the bruising is gone and the tattoo looks great! 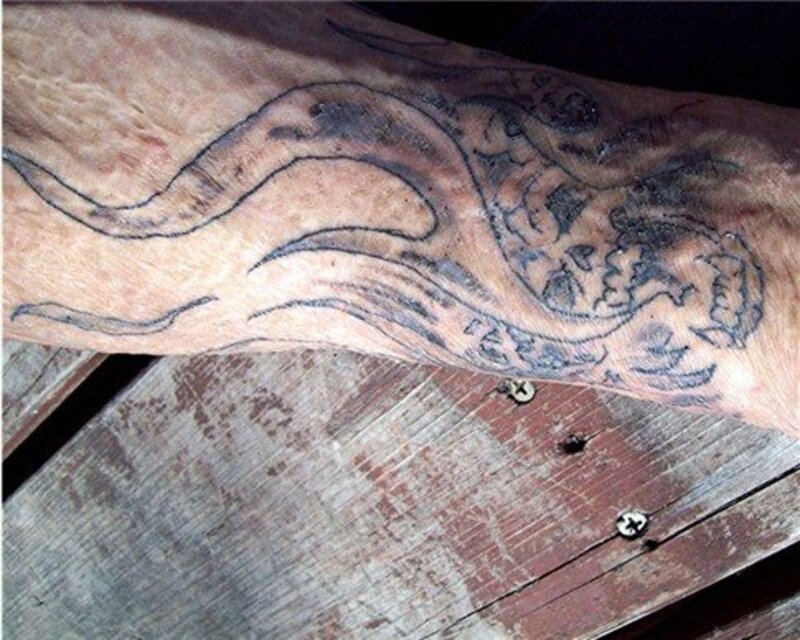 We now know that tattoos can look great on scarred or grafted skin. Scott is very happy with his new tattoo and can hardly wait to get more. 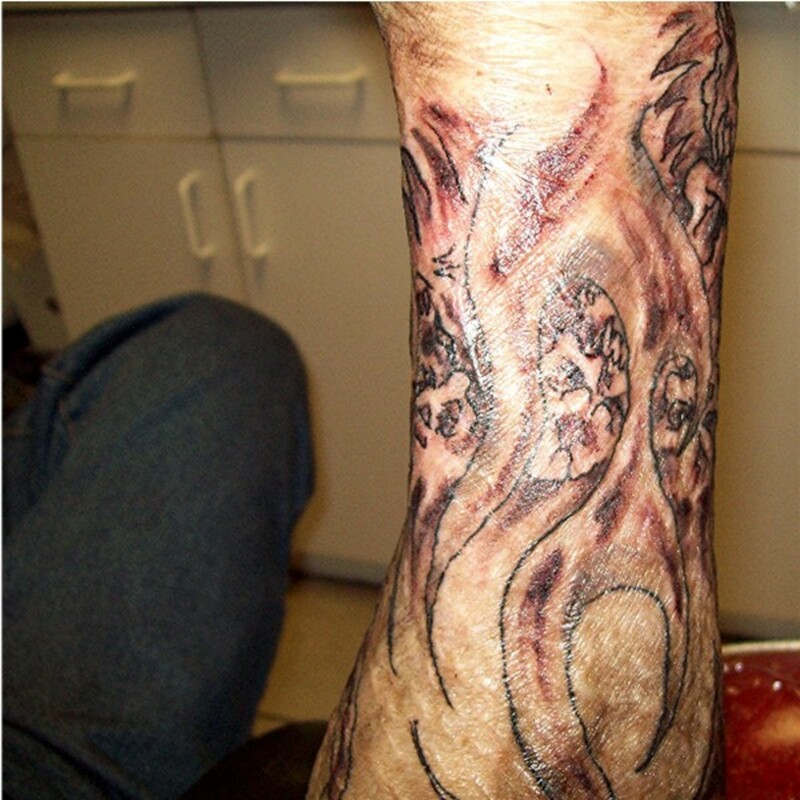 He has shown his new tattoo to other burn survivors, and they are very excited to learn that they also can successfully get tattoos on their grafted skin once it is fully healed. We'd like to thank Mr. DANG and Be-Cool Tattoo for making this informative article possible. We hope this information will be helpful for other burn injury survivors or anyone thinking about getting a tattoo on a scar. Hi, can anyone advise me on a good tattoo artist who would be willing to work on grafted skin, i have made contact with a few tattoo artist who at first seemed interested but then stopped replying. Im sure there would be somebody willing to do the cover up tattoo im just struggling to find one. Any ideas would be gratefully recieved. I had a tattoo over a burned area on my ankle. I don't know why? It is also bleeding in area's. I will be going to the doctor soon to find out why. But could it be that it's old and needs lotion on it? I am still in hospital after being severely burned from catching fire in a minor kitchen explosion. Reading stories like this help me to remember that I can come through this and be strong and beautiful again - just like Scott. Maybe if you were a better tattooist the art would've came out better! I have been a burn victim since I was a 6 month old baby. 75% of my face is scared and I have been wondering if a skin color tattoo would even out the different skin color. Now I'm 41 and would love to see myself different before I die. I have never seen a picture of myself without the scares and wonder if this is even possible. Thank you so much for this. I have had a skin graft on my shoulder for 45 years and have been thinking of covering it with a tattoo. This is the best example on the web I have found with photos and a real live story behind it. This has really helped me. Looking amazing! But I have a huge wonder about the pain while putting the tattoos. 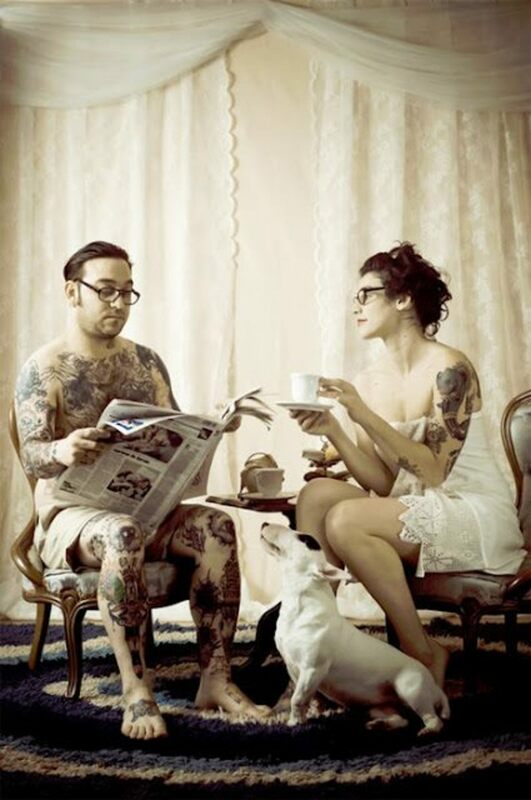 I have a great desire to talk with someone of having tattoo!! I know it's sounding funny but I really feel like it. Thanks for a cool input. Is there an ink out there that is better for the scar to take? If so what is it , and the cost? What a beautiful way to "reclaim" skin that has seen trauma. Scott's tattoo is wonderful, and your friend is a very talented artist. Awesome! you've help me make up my mind. I'm a survivor from breast cancer, i had skin graft from back to breast, in May 2012, i was left with scars. I'm just waiting to let them heal. Thank you for this infor. 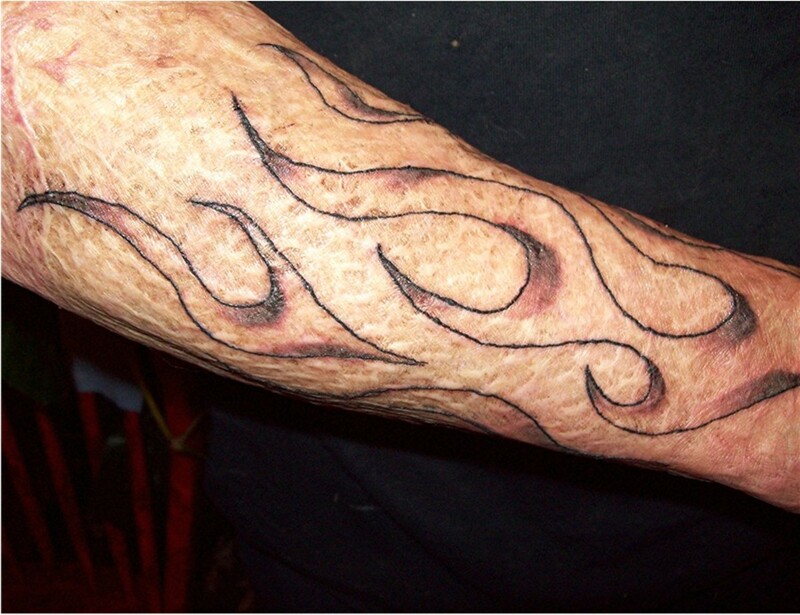 Tattoos over grafted skin is indeed something that I would not have thought of but definitely an art form that many burn victims would consider. Great information. Thank you for this, very interesting &amp; informative about tattoos on burn scars. I was interested in tattoos over surgical scars and this is a well done article. Great service piece with all the nitty gritty questions answered. Thanks for sharing - the tattoos look amazing. I don't have burns - but scars from surgery and have been curious about what the process might be like. Thanks for sharing. thanks so much! im a burn survivor as well, 2and a half years post injury and hoping to get some tattoos eventually and this has really helped me a lot! u guys rock!! @photofk3: I am a burn victum its been 6yrs now got grafs on my left leg pretty bad and my right hand fingers need a tatoes on my back and legs to cover my burns and back where my skin was peeled off my back. Is their someone out their that can help me out, the problem is I am a widow and can't afford to pay, Is their an angle out their please!!!! Awesome tattoo story! (thanks to CCGAL for pointing this page to me). I had read about a lady who got a vine &amp; flowers tattoo to disguise the surgical scar left from an abdominal surgery, but I never would have thought about tattooing grafted skin. This is the sort of thing that Squidoo is such a great platform for sharing. Even though I don't do tattoo myself, I found myself fascinated by your story and the photos. WOW. For YearsI have considered a tattoo to cover my burn scar on my upper arm. I have since covered my arm wearing a long sleeve shirt even in the hottest weather. I am sooo glad that this article was written. I look forward to checking out a reputable tattoo parlor so I can once again not feel so self conscious and be able to feel comfortable when I am shirtless. Thank you so much for this article! Unususal and interesting lens. Keep it up. This is an incredible story. What a great way for burn victims to reclaim their bodies! Congrats on your purple star!! What an interesting lens, and helpful too. Congratulations on your Purple Star Bambi - this is a fascinating Tattoo lens. Your Purple Star has been awarded by our Purple Star Queen of the week, luvmyludwig. ohh thank you very much for the information.! i'm planning to get a tattoo dats y on my scar that I had when I was still 4. Since I'm turning 18 next month it will be legal to get a tattoo just to cover my scar on my leg. Nice tattoo, and nice scars too! :) Now that I've seen someone else do it, I'm wondering if I'll ever miss the scars on my legs after I tattoo over them? I've had them for almost 24 years, since I was an infant. It's all I've ever known my left leg to be. 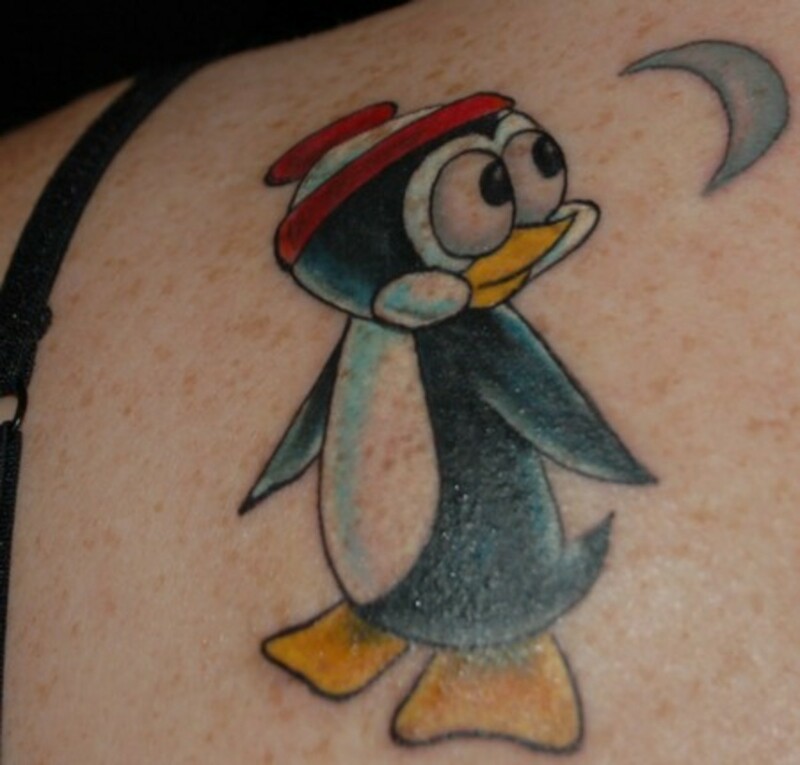 But like you said, getting the specific, special tattoo that I want will make it nice. Excellent, very personal lens. The pictures of the tattooing itself were very interesting. wonderful job. 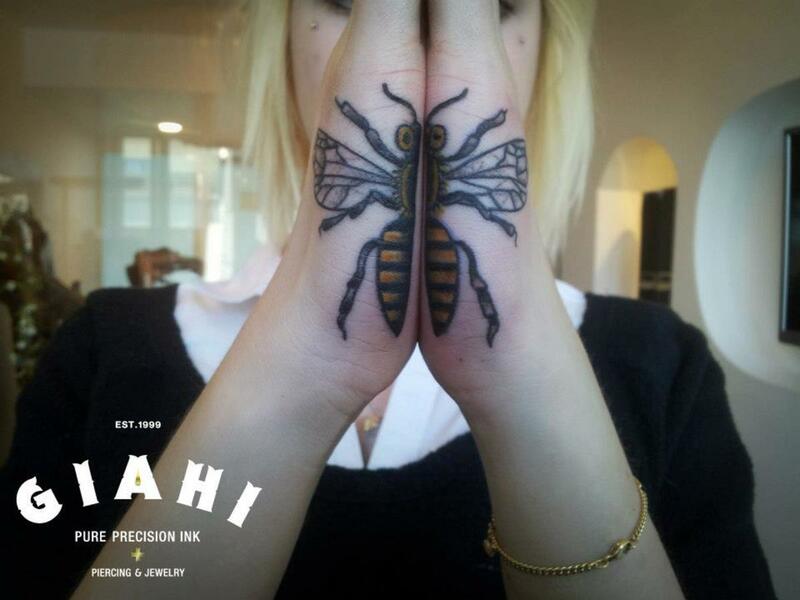 I am glad that you and hubby were able to find someone so talented to do the tattoo. I am a huge tattoo fan! I am sure this lens will be a great place for people to go for information. Another stellar lens Bambi! Excellent information for people who want to get tattoo's on grafted skin! Very, very nice lens. I loved the pictures and personal feel. You and Scott did a wonderful job. 5 star lens for sure. Nice lens! I'm sure there will be a lot of people checking this one out!